Where do we start? Okay, let’s get this off of our chest first. This might as well be called 13 Hours: The Secret Bearded Army of Benghazi for all of the bushy facial fur that adorns each member of the special US forces in the telling of an embassy under siege in Libya in 2012. In fact, there are more beards here than the staff list and customer queue at a Hackney craft beer pop-up. They wouldn’t win an award for individuality either. Not one of them has chosen to opt for a Craig David circa-2000 style or t’other. Lazy. But, sniggers aside, the reality is that we have Michael Bay covering a political story based on truth; for, yes, it would appear that the man who believes that the world needs 403 different Transformers films (at last count) now has Oliver Stone aspirations. This is actually true. Do. Not. Adjust. Your. Set. This cannot be right, can it? Well, this writer can personally vouch for the fact that they sat through 2 hours and 24 minutes of this film and didn’t see one Decepticon or scantily clad woman in sight. I’d even take a Jeremy Kyle lie detector polygraph to prove it. In fact, once the lights went up, the shock didn’t rest easy. It just couldn’t sink in. I had to have my friend slap me repeatedly on the face and yell at me, ‘you can’t handle the truth’ as I babbled incoherently like a possessed ventriloquist’s dummy. God knows what the other cinema clientele thought. That’s not how I usually roll. Of course, there are explosions aplenty, and Michael Bay extravagantly trammels the tropes, for better or worse (depending on the point of view), synonymous with his jumpy, itchy camera and pumped-up machismo. He only ever musters the merest modicum of a soul, but on his own relative basis, this flick is the most soul we’ve seen from him to date. It is certainly a little away from the jingoistic mish-mash, disastrous mess of Pearl Harbour, as matters rest on a mournful, US-foreign-policy-critical coda. 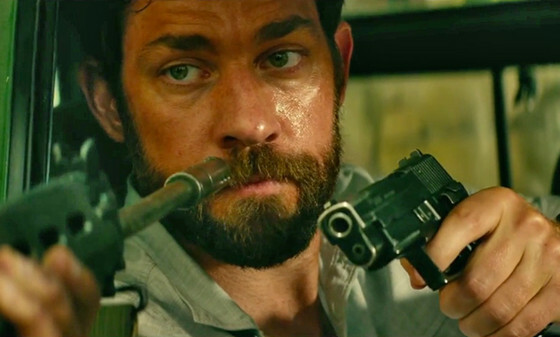 13 Hours: The Secret Soldiers of Benghazi is in cinemas from 29th January 2016.